The world famous hatch of the Western Green Drake is one of Colorado’s most noteworthy summer fly fishing events. Anglers travel from all over the world to experience the emergence of this large mayfly on rivers like Colorado’s Roaring Fork. Fish of all sizes abandon the safety and cover of deep water to rise to the surface and take down these these big, graceful mayflies. In order to properly fish this incredible hatch, it is important to understand when and how it happens, and what patterns you will need to represent the green drake’s various life stages appropriately. The Western Green Drakes fall into the crawler category of mayflies, meaning that their emergence begins with a crawling migration along the bottom of the river to calm, shallow water, followed by an awkward swim upward to the water’s surface where they complete their transformation into adulthood. Once they have broken free from their nymphal shuck, they wait motionless on the surface of the water for their wings to expand and dry. It is during this short migration and transformation that the green drakes are most vulnerable to predation from hungry trout. Once they are ready to fly, the duns escape to nearby vegetation where they will mate and rest before laying their eggs and falling spent into the water where their lives come to an end. This process usually takes about a day, beginning in the late morning or early afternoon and ending throughout the evening and early the next morning. In order to be fully prepared for the green drake hatch, anglers should have an arsenal of patterns that covers the entire hatch process and includes green drake nymphs, emergers, cripples, duns, and spinners. This is a short list of some of my favorites for each life stage. Green drake nymphs come in a wide variety of colors ranging from dark brown and black to bright green and even yellow depending on their environment. For example, a nymph that has just molted will usually be brighter in color than one that has not. For this reason, I use everything from the size 10 to 12 Chartreuse Copper John to the peacock colored Twenty Incher. Instead of waiting to get all the way up to the water’s surface to break out of their exoskeleton and transform into adulthood like many other mayfly species, the green drake emergers actually begin their metamorphosis underwater. Along with their undulating body motion, tiny pockets of gas within their exposed, crumpled wings help the nymphs rise to the top. 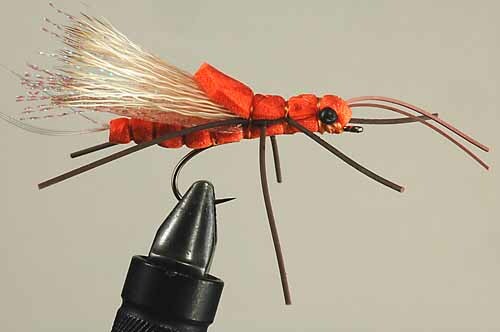 I like to use patterns with buoyant wing materials like CDC which help to keep the flies upright and suspended within a foot or so of the surface. Both the CDC Green Drake Emerger and Mercer’s Poxyback Emerger in sizes 10 through 14 work very well for this. Low light, humidity, and turbulent water can all work against the already struggling green drake emergers, preventing them from completely escaping their nymphal shucks. Trout see these half-hatched stillborn or crippled drakes as easy targets and can hardly resist the possibility of a free meal. I like to switch from dun patterns to cripples when I am trying to catch heavily pressured fish or when drakes are hatching during a cloudy, humid day and the water is filled with these trapped emergers. Stillborn patterns have also come in handy while fishing to one specific fish that has already gotten a close look at the dun, but has lost interest. One of the best stillborn western green drake patterns is Lawson’s Green Drake Mayfly Cripple. The elegant green drake dun is usually the main attraction of the western drake hatch and it needs little explanation. Trout seek out and feed on the duns while they ride on the water’s surface, waiting for their wings to fill up and dry out. The best green drake dun patterns are made with dull colors, have dark gray wings, and ride high in turbulent water. My favorites include Furimsky’s BDE Extended Body Green Drake, and the Colorado Green Drake in sizes 10 through 14. After the green drake dun escapes to the safety of the nearby vegetation, it undergoes its final transformation into a fully mature adult insect. Once again, it emerges from its outer shuck with clear wings and long, thin tails. After a short rest, these sexually mature adults begin to mate. Once they have finished mating, the females return to the water to lay their eggs before falling dead or spent into the water for trout to find and eat. More often than not, the spinner fall occurs late in the evening or throughout the night. Rain, wind, and cold weather can delay the spinner fall until the following morning so that fly fishermen can fish successfully with spent fly imitations like Jeff Andrew’s Clear Winged Spinner Drake, and the Green Rusty Spinner. If you have not had the chance to see this amazing hatch for yourself, you are missing out. 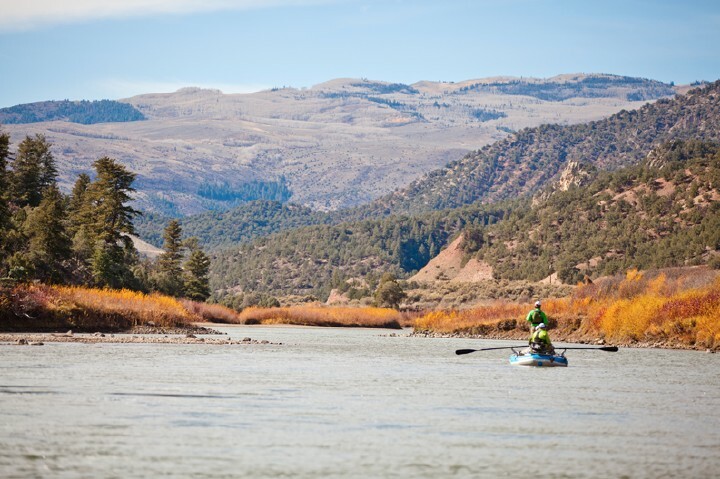 Colorado is home to a number of world class rivers and streams that feature epic western green drake hatches, and many of them last for over a week. Fly fishermen can have the time of their lives fishing at places like the Eagle River, Frying Pan, Roaring Fork River, and Gore Creek, Piney Rivers when the drakes are hatching. The best way to see this hatch for yourself is to book a trip with one of the professional guides here at Vail Valley Anglers and let them show you the beauty and excitement of the western green drake.